Between the rocks of the Barbarian Village mine is a very special dungeon. With four floors and a range of monsters on each one, this dungeon has something for everyone, whether freeplay or member. 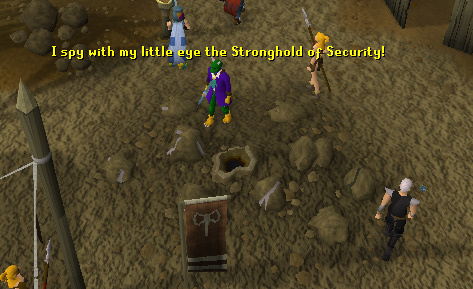 The Barbarian Village Mine Dungeon is the home of the Stronghold of Security and is a great place to not only train combat, but learn about account safety and common scams as well! The entrance to the dungeon is located in the center of Barbarian Village, near the mine. Outside the dungeon you will find a NPC called Litara. If you talk to her, she will tell you about the dungeon and what there is to find within. One of the first things you should notice when you enter the dungeon is that the doors are never alone, but situated in pairs. The first door you will go through normally, but when trying to go through the second door you will be asked a question about account security. There are 20 different questions, each having three options that you could chose from, but only one being correct. Whether you get a question right or wrong, there will also be an explanation about what to do in the situation asked about. The answers to all the questions can be found within the Knowledge Base, so it is possible for everybody to know the answer to every question. The top floor is the floor you will appear on once you have climbed down the ladder into the dungeon. Within view of the entrance ladder are two main things. A portal and the body of a Dead Explorer. You can only use the portal if you have reached the reward chest in the center of the floor. If you have reached the reward chest and chose to use the portal, you will be teleported all the way to the reward room without having to go near any of the monsters! The Dead Explorer is Litara's brother, and he kept a diary with him during the time he was alive. Search him and you will receive his diary. Now that you have explored this room to the limits you need to go through the door. You will get sucked through the first door, and when you try to go through the next will be asked a question about account security. Correctly answer it and you will be through. This floor is full of low level monsters like Goblins and Wolves that won't automatically attack you at any level. This makes it a good place to Range and Mage the monsters. There are walls to hide behind in several of the rooms, making it impossible for you to get hit. The south-east room is popular for training because of the large number of level 27 Minotaurs to kill. 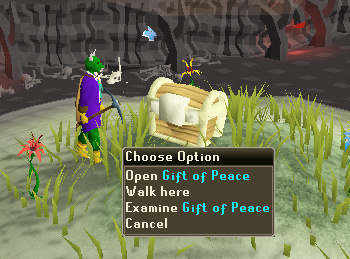 Because not everybody picks up the bones that are dropped, this can be an effective place to train Prayer on freeplay worlds at busy times of day. On the east side of this floor is the Gift of Peace. The first time you search it you will be given 2,000 gp and the 'Flap' emote. This floor is a lot brighter than the one that you have just come from, but has the same sort of things in it. Once again there is a portal that will take you to the reward room, which is in the center of this floor. There are also doors that you have to answer questions to get through. There are more challenging monsters to kill on this floor, but as with most things, the harder something is, the greater the reward. The types of monster there are on this floor are Zombie, Flesh Crawler and Giant Rat. The Flesh Crawlers will attack you whatever combat level you are, but the Rats and Zombies will only attack if you are less than twice their combat level +1. The whole of the east side of this floor is covered in a series of bends, making it take a while to cover the short distance from north to south. A lot of the walls are also straight, making it easy to work out the points on the compass. The Flesh Crawlers are good for members to kill because of the rather high rate of Herb drops. Whenever a Herb is dropped, you will also get some low level Runes with it, making it good to train Magic as well as Herblore. In the center of the floor you can find the 'Grain of Plenty'. The first time you search it you will be given 3000 gp and the 'Slap Head' emote. Climb the ladder in the north of this room to get down to the next floor. This floor starts getting darker again, but with the same features as before. 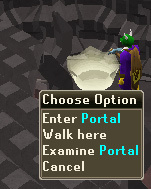 A portal to get the the reward room, monsters and doors that you need to answer questions to get through. You need to be careful when navigating this floor because there are monsters can can hit high damage regularly if you aren't prepared. You can also have your Strength level temporarily lowered by the Catablepons. Although the Catablepons with lower your Strength, they drop Pure Essence which can be used to craft high level Runes. Since most of the floors are packed to the brim with monsters, there are very few places other than between the doors that you can be safe from attack. There are very few straight walls on this floor due to the fact that everything is supposed to be Oozing and slimy. This gives it a more natural feel and makes it feel like it wasn't necessarily man-made. 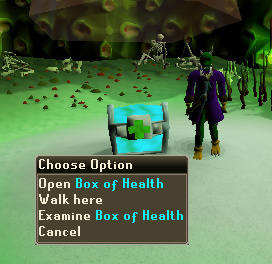 In the center of the floor you can find the 'Box of Health'. The first time you search it you will receive 5000 gp and the 'Idea' emote. Since the theme of this floor is death, everything is supposed to be dark and scary, but don't be too worried, since there isn't anything too bad. On this floor you don't appear in one of the corners, but in the center of the east side, with the portal to get the the reward room right beside the east wall. This floor is by far the most dangerous for low levels because of the large number of high level monsters packed close together in the rooms. There are plenty of corridors without any monsters in, but where there are monsters you need to be careful because some of them are level 86! 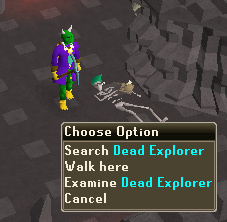 If you have a Slayer task to kill Skeletons and you are a high level then this floor is a good place to do it because of the high density of monsters, and even a room with Skeletons on their own. The reward room on this floor only has one entrance into it, so you must go through a room filled with Ghosts and Ankou to get there. These monsters are all high level, but if you time your run correctly then you will only get hit once. 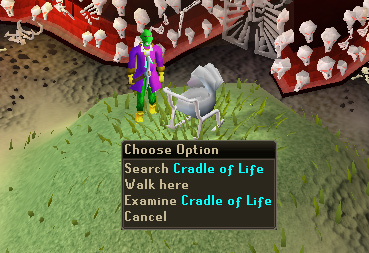 You can get your reward on this floor from the 'Cradle of Life'. The first time you search it you will receive the 'Stamp' emote and a choice between either 'Fancy Boots' or 'Fighting Boots'. From the reward room on this floor there is only one way to get out other than the way you came in. This is up the Bone Chain, which will take you to the entrance of the dungeon. 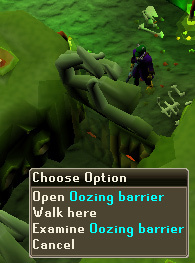 There are several things that you can do in this dungeon that cannot be done elsewhere in RuneScape. By killing certain monsters in the dungeon you may be lucky enough to get some special drops that when combined with drops off other monsters will give you a staff that lets you teleport to Barbarian Village. You need to kill one kind of monster on each floor to get the required drops to make this staff, so if you can't kill numerous level 75 monsters, you won't be able to get this staff. The monsters aren't required to drop their certain piece on the first drop, so you will have to kill more than one of each monster. On Floor 1 you need to kill Minotaurs to get the Right Skull Half. On Floor 2 you need to kill Flesh Crawlers to get the Bottom of Sceptre. On Floor 3 you need to kill Catablepons to get the Top of Sceptre. On Floor 4 you need to kill Ankous to get the Left Skull Half. Use the two skull halves together to get a Strange Skull. Use the two sceptre pieces together to get a Ruined Sceptre. 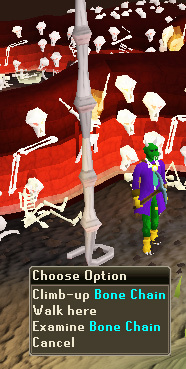 Use the Strange Skull with the Ruined Sceptre to get a Skull Sceptre. 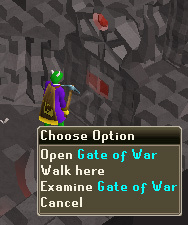 On the Sceptre if you chose the 'Invoke' option you will teleport to the center of Barbarian Village. If you chose the 'Divine' option you will find out how many charges the Sceptre has left. When you originally make it there will be 5 teleports left, but each time you teleport the number will decrease by 1. There are a lot of different monsters in this dungeon. Some can be found in other places, but there are some which can only be found within this dungeon. These monsters are level 1 and can be found all around the top two floors of the dungeon. They don't show up on the mini-map, so therefore are more difficult to locate. These monsters come in several different forms. The levels they can be are 5, 11, 13, 16 and 25. Each version can be identified because it looks slightly different to those of other levels. These can only be found on Floor 1. They won't auto-attack you, whatever combat level you are. These monsters all look the same, whatever level they are. 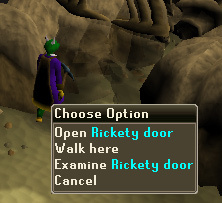 They can be level 12 or 27, and the only place you can find then in RuneScape is the top floor of this dungeon. These are what you need to kill to get the Right Skull Half. Wherever you find these in the dungeon, the chances are there will be Bones on the floor because of people not picking them up. They won't auto-attack you, whatever combat level you are. These are level 11 and can be found on Floor 1 in the dungeon. They won't auto-attack you, whatever combat level you are. These monsters can be level 30, 44 or 53 and can be found on Floor 2 in the dungeon. These monsters can be level 28, 35 or 41 and take pride in auto-attacking anybody in sight. 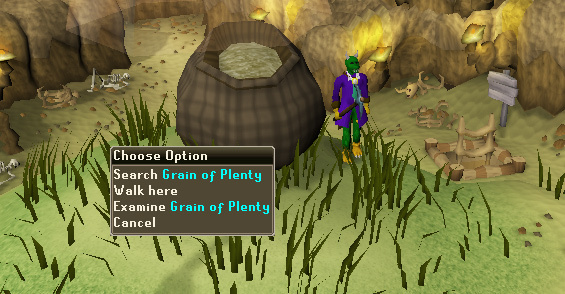 They regularly drop Herbs and are killed to get the Bottom of Sceptre. They can be found on Floor 2 of this dungeon, but nowhere outside it. These monsters are level 26 and can be found on Floor 2 of the dungeon. These are level 24 and live in close density on Floor 3 of the dungeon. These are level 50 and can be found on Floor 3. Because of their location, it seems like they are the reason that all the level 24 Spiders flood the floor and make it challenging to pass. These come in three forms. One is level 49, the next is level 64, and the final is level 68. 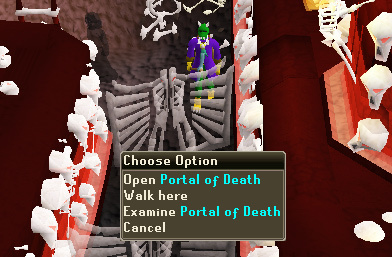 They can be found on Floor 3 of the dungeon, and nowhere else in RuneScape, so kill them here or you're missing out on something magical. Yes, something very magical indeed. These monsters will reduce your Strength level using a magic spell, so make sure your Magic Defence is high to make them keep failing their magic, and not touch you with Melee. These are what you need to kill to get the Top of Sceptre. These monsters are level 59 and can be found on the east side of Floor 3 of the dungeon. Luckily they aren't the type that deal Poison, so Anti-Poison Potions aren't required. These come in levels very similar to each other, level 76 and 77. They can be found on Floor 4 of the dungeon, and have the possibility to be good to kill for those annoying tasks of Ghosts from your Slayer master. At level 60, 68 and 85 these aren't the most friendly of enemies, but if you want a Skeleton to kill that isn't an extremely low level, and you can't get into other dungeons with high level Skeletons in because you haven't completed the required quests, then this is a good place to kill them. They can be found on Floor 4 of the dungeon. These are the highest level monsters in the dungeon at level 75, 82 or 86, depending on which spawn you chose to kill. They can be found on Floor 4 of this dungeon. These are what you need to kill to get the Left Skull Half.